Home / Blog / The Siamese rosewood craze: for whom the bell tolls? 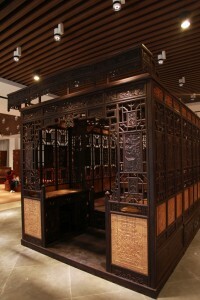 In a glamorous hongmu showroom in Shanghai, streams of the bustling crowds slowed down to appreciate sets of exquisitely carved Siamese rosewood furniture. What attracted the potential hongmu consumers and investors, beyond the fine and delicate craftsmanship, are the hefty price tags that any ordinary workingmen could only afford to look at. Few of the audience had, for a second, thought of the Siamese rosewood trees that had been growing for hundreds of years along the Mekong River before being cut down to become a piece of furniture. Siamese rosewood (Dalbergia cochinchinesis) is a species that has lived longer than human beings on this planet earth. Yet recent decades of rampant demand for high-end furniture are driving the species to the brink of extinction. The dead-end situation that Siamese rosewood is now facing goes beyond merely an environmental or ecological problem – it is a bloody corrupt war with cruel costs, such as human lives, as uncovered by EIA’s recent report Routes of Extinction. 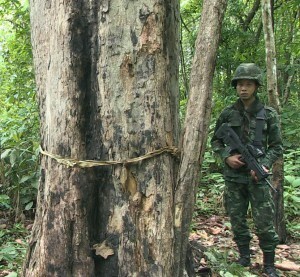 From Thailand to Cambodia, Laos to Vietnam and Singapore to mainland China, EIA’s investigators posed as buyers to meet with scores of traders to document the complex trans-national supply chain of the hongmu business: loggers were lured into the remote forest with cash payments, even drugs, and many have lost their lives during the exchanges of gunfire with Thai forest rangers; a relative of high-ranking Laotian military official took batches of Chinese timber traders into the military yard to shop for illegal hongmu woods which were confiscated by the military; a local Vietnam gangster explained how he had paid off border officials to facilitate his hongmu smuggling operation to China, while stacking bundles of cash in a bag; in the ports of Hong Kong and Shenzhen, a well-connected logistics agent claimed to have connections to prepare papers to legally bring illegally sourced Siamese rosewood into China; in Fujian, shrewd businessmen have already shifted their bets on replacement hongmu species with funds gathered from Siamese rosewood investment vehicles. Siamese rosewood, known as Lao hongmu in the Beijing region, is one of the most sought-after raw materials in the hongmu industry in China. Despite it being protected in all its range states and its international trade being restricted by an international convention, EIA found that as recently as this March, many Chinese businessmen were still illegally sourcing Siamese rosewood raw materials in Laos, Thailand, Vietnam and Cambodia. These traders wasted no time in taking these raw materials to China, often via Hong Kong, through bribery and smuggling. The Mekong region has historically been a supply base for China’s hongmu industry and has also been most affected by the hongmu resurgence of the past decade. Since 2000, nearly half of the hongmu China has imported is from the Mekong region. For decades, Chinese and Vietnamese traders have scoured the region for precious remaining Pterocarpus and Dalbergia species. The commercial extinction of higher grade hongmu species such as Dalbergia odorifera (known as Huanghuali) due to excessive harvesting for China’s hongmu sector has resulted in Siamese rosewood becoming one of the most prized hongmu species. But in 2013 and 2014, the timber traders EIA met in Laos and Vietnam all said that Siamese rosewood’s golden age is now a thing of the past – it is increasingly difficult to source Siamese rosewood raw materials, hence most have already moved on trading other species such as Burmese rosewood and Padauk. According to these traders, supply of these two species would last no more than three to five years. 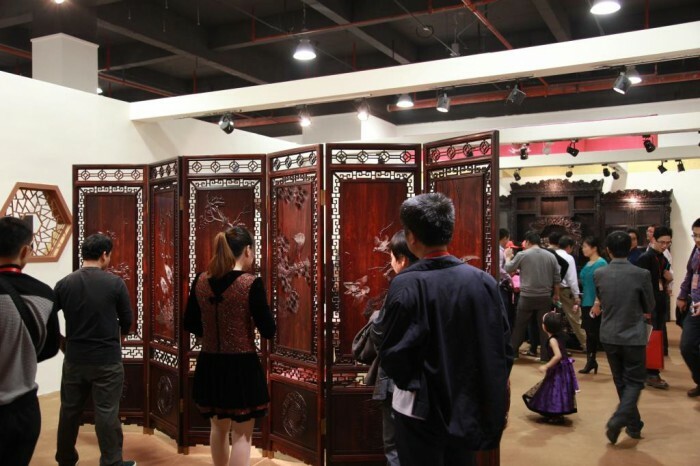 The surging demand for high-end Ming and Qing dynasty reproduction furniture, together with the under-regulated expansion of the hongmu industry, threaten to wipe out some of the mostly iconic species revered in traditional hongmu culture. However, the current hongmu craze in China does little to revive the Chinese cultural heritage. On the contrary, under the cover of cultural tradition, most hongmu businesses are in fact driven by speculation and hype, undermining the resource supply on which the traditional hongmu culture depends. Supposedly, the main responsibility of protecting Siamese rosewood lies with the range states in the Mekong region. But the weak and corrupted enforcement and ongoing legal and policy contradictions which promote and provide mechanisms for trade in illegal rosewood have encouraged and sustained the illegal hongmu trade. As the major hongmu consuming country in the world, China has a responsibility too – Chinese consumers and investors have both an obligation and a right to fully understand the hongmu business in order to make rational purchasing options, they need to especially be aware of the negative impact of illegal hongmu trade has on the environment, the rule of law and the human lives. The Chinese Government has the obligation to establish a clear legal boundary by which illegally logged timber will be excluded from the Chinese market, and at the same time carry out reforms in the hongmu industry to make sure it won’t stimulate demand for endangered species and to put an end to the illegal hongmu trade.